ProtonMail is still in Beta mode after their recent successful funding campaign on Indiegogo, and are planning to launch an iOS and Android app very soon. The service uses proven cryptographic algorithms and because of its end-to-end encryption, your data is already encrypted by the time it reaches its servers. 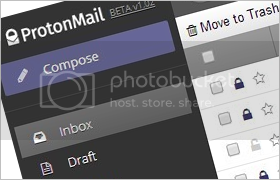 ProtonMail has no access to your messages, and therefore can’t share them with third parties. The servers are also hosted in Switzerland outside US and EU jurisdiction so all user data is protected by strict Swiss privacy laws. Even your communication with non-ProtonMail users is secure via symmetric encryption. When you send an encrypted message to a non-ProtonMail user, they receive a link which loads the encrypted message onto their browser which they can decrypt using a passphrase that you have shared with them. You can also feel secure in the fact that ProtonMail does not track or log personally identifiable information like user activity, or metadata such as the IPs used to connect to accounts, or the times certain accounts are accessed. Another nice feature is that you can essentially burn an email after a certain time period by setting an optional expiration time, so they will be automatically deleted from the recipient’s inbox once they have expired. Head over to the website and read more about the features and security they offer and signup to reserve your name – ProtonMail.